March | 2013 | Maintain Your Composer! This entry was posted in Uncategorized on March 21, 2013 by janaigus. 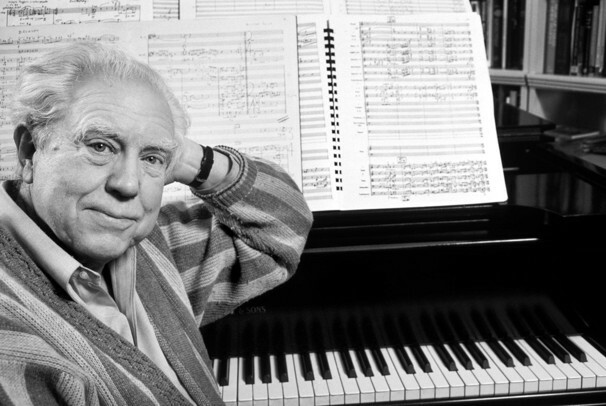 We take a quick break in the realm of film composers to address a work by American composer Elliott Carter. The piece in question is Brass Quintet, a wildly difficult work composed in 1974. Carter created this effect by, as mentioned above, crafting a single movement work that, upon initial listening, has no cadence points. I think the hardest measure to perform would be a measure that contains implicit interplay between two or more parts, such as in measure 43 or 281. However, the issue of difficulty makes me wonder if this piece is meant to be performed in a Babbitt-ian sense or a Strauss-ian sense. That is, does every black mark on the page need to be exactly precise, or is it more the effect that is important, with the notation just showing one example of how it might look? I think it is valuable in a course such as this to explore all types of brass ensemble music. Although this piece does not fall in line with my personal compositional aesthetics, others may feel differently and be moved accordingly. However, the infrequency at which this piece is performed does raise questions to its relevancy. Carter studied with Nadia Boulanger and Charles Ives, which explains the avant garde style with shreds of tonality. Perhaps more enlightening are the influences of thinkers like Einstein and James Joyce, lending to his music the element of complexity. Davison’s quintet is much more traditional in the sense of formal and harmonic structure. Aaron Copland (1900-1990) is often associated with codifying the sound of American music. 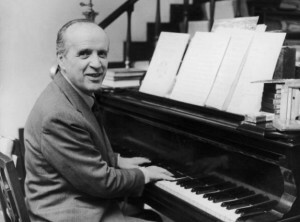 His compositional style featuring open intervals and the incorporation of jazz and folk tunes contributed to the success and popularity of his music. While best known for his concert works including music for solo instruments, symphonies, and ballets, Copland was also an active film composer, scoring films such as Of Mice and Men, The North Star, and The Heiress. 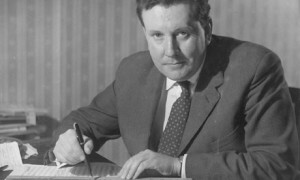 Malcolm Arnold (1921-2006) was a British composer of film and concert works, whose original score to The Bridge on the River Kwai won him an academy award in 1957. In his life he composed over 100 film scores, and many concert works including nine symphonies. This entry was posted in Uncategorized on March 20, 2013 by janaigus. 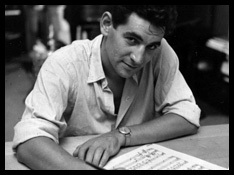 A Renaissance man of the musical world, Leonard Bernstein (1918-1990) was a composer, conductor, writer, and also accomplished pianist. He is perhaps best known for his work from West Side Story and his time with the New York Philharmonic (quick tempi and all!). While his compositional output is tremendous, his work in the film genre is rather limited, with On the Waterfront as one such original film. 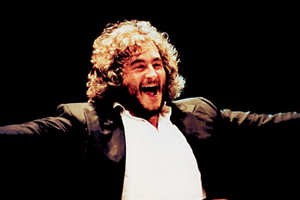 Michael Kamen (1948-2003) was a composer of primarily television and film music. His musical background is unique, although when compared to other film greats, follows similar trends. Kamen was part of a rock band, in which he performed, among other instruments, the oboe. Being well versed in pop music led him to be desirable as an arranger, which down the road led to his own compositional voice being able to be heard. As a comparison, Danny Elfman started off in a rock band, and John Williams started in a jazz combo, of which he was an arranger. 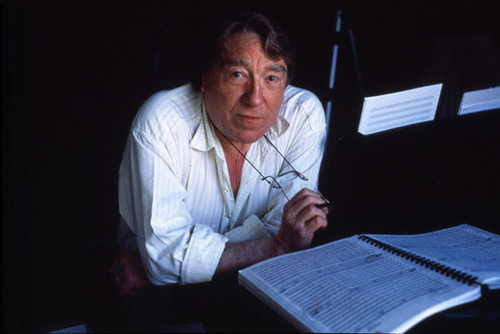 His most notable film scores are from Robin Hood: Prince of Thieves and The Three Musketeers, although music enthusiasts will often also known his work in Mr. Holland’s Opus. Given my last two posts, I feel as though I am on a film composer kick, so why not continue the trend? Perhaps that will be the future direction of this blog. However, I feel as though many film composers do not actively pursue concert works on the side, so this theme may run its course soon. However, in the meantime, let’s explore the brass ensemble music of Georges Delerue! This entry was posted in Uncategorized on March 7, 2013 by janaigus. 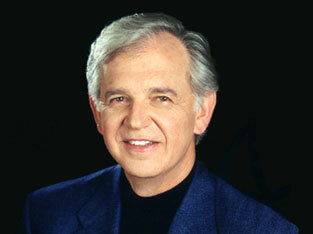 Bruce Broughton (b. 1945) is an American composer of film, television, and concert music (as well as many other genres) whose musical influence, despite his relatively recent absence in the cinematic spotlight, is wide reaching. Fanfares, Marches, Hymns & Finale for Brass Ensemble and Percussion.